As a perfectionist in his craft, Gordon has used many different makes of guitar and equipment over the years. He uses up to 6 different guitars on stage during a show, a pedal board to give him the delay effects, and a loop station to multitrack his electric guitar. 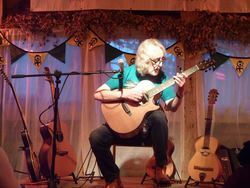 Gordon writes: "It has been my privilege to have owned many fine guitars over the years, expensive and otherwise, my Car Boot guitar used to perform Appalachian Dreaming is a prime example. Here is a list of instruments that I currently own, use on stage and in the studio". FYLDE custom GG signature model, plus the updated maple and cedar version. FYLDE custom model rosewood and cedar. JHS Vintage Armstrong designed deluxe model. 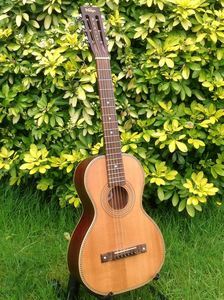 Vintage Paul Brett Viator guitar. Vintage Paul Brett Viator 12 string. Fret King GG signature Elise electric. Fret King Carona Fluence electric. Paul White Custom built "Strat"
Danelectro Back to Black electric. Gibson J200 Pete Townshend model. Joe Veillette Gryphon 12 string. 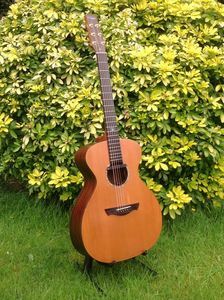 Roger Williams electro acoustic nylon string. 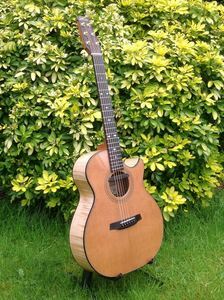 I use Fishman Rare Earth blend pickups on the acoustics. 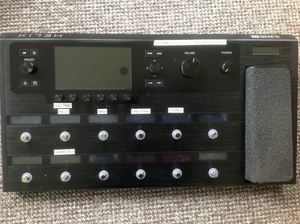 My one and only FX unit is a Line 6 HELIX. Martin and Newtone Strings and G7th capos. For electric guitar I find that Ernie Ball strings are consistently good. For recording I use a Schoeps microphone with a Rob Aitchison designed H clamp. 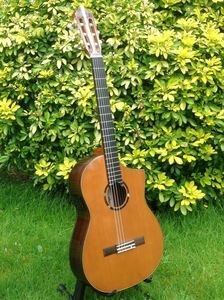 I feel very proud to have been instrumental in bringing this lovely Roger Williams cross over classical guitar to market. This was designed to appeal to steel string players wanting to make the transition over from steel to nylon strings. The low action and narrower neck help to achieve this. This is my beautiful FYLDE new edition signature model with flame maple back and sides with cedar table and diamond cut inlays in the ebony fingerboard. This is my Vintage Rob Armstrong designed deluxe signature model. This is my Fret King Trev Wilkinson designed GG signature electric. This one is the latest edition of the signature model that had a piezo pickup in the bridge. 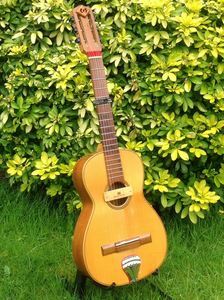 A Paul Brett Viator "travel guitar". Don't be fooled by the price and size of this lovely instrument. It sounds beautiful and I have recorded with this very this sweet little guitar. I have always loved the sound of these guitars with the lipstick pickups and "functional" construction. 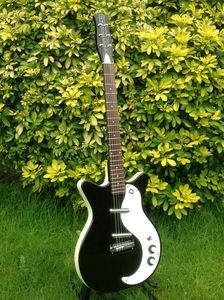 This is a modern Danelectro but the pickups are said to be of an older vintage and certainly give the instrument a clarity and depth like no other. A favourite of many famous players. Jimmy Page for example. 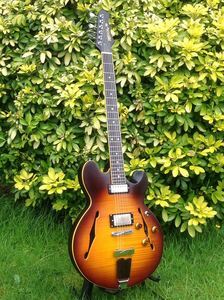 Here is my legendary "car boot” hi-brid guitar, that shouldn't sound as good as it does. My HELIX pedal is a God send. It does everything I need and more. An amazing piece of kit. 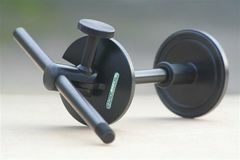 The ExplorAudio H-clamp allows almost any microphone to be attached to essentially any guitar. Scroll down to file at bottom of this page for more info. 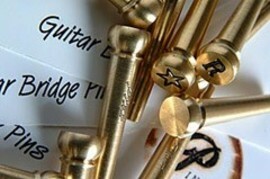 Put simply Pinz are slotted brass bridge pins for acoustic guitars. But they're more than just that. They are a unique enhancement to your guitar. Pinz started as blank or - uniquely in the world - engraved pins, and we've since added abalone/paua and mother of pearl inlaid versions. Blank they reflect light nicely; engraved, they put your name on the guitar. The new inlaid versions look just beautiful, and can colour key to your instrument. 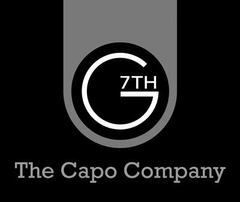 I have known Nick Campling the inventor of the G7th capo for more years than I care to remember. He created in my opinion (and many more) the finest guitar capo known to man. I have used mine for years and it has never let me down. 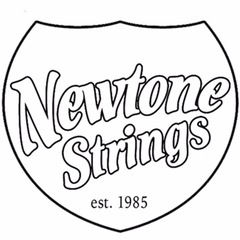 Many of you will know of my long association with the British string makers Newtone Strings. On October 5th 2018 the company are launching a GG Signature set as part of their Heritage range. I was very privileged to help with the development and design of the Newtone range many years ago with its founder Malcolm Newton.